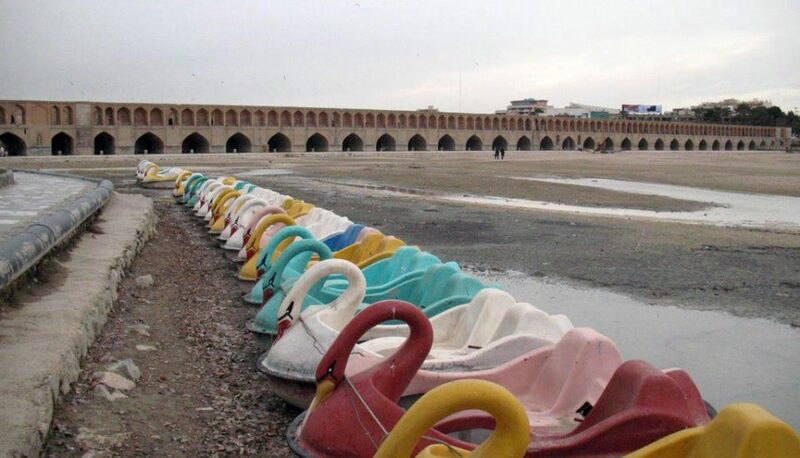 Photo 1: The riverbed of the Zayandehroud river in Isfahan that has dried up (source: Mahdi Kalhor, Panormio). The population in the Zayandehroud basin has increased dramatically in the past 55 years. According to the 1956 census, the population in the basin was around 420,000; in 2011, that number had reached an estimated 4.5 million. Agricultural and urban development in the basin has always been constrained by water availability. However, the history of the basin’s water development is not (yet) a story of limits. Demand – largely generated by expansion of irrigation schemes – has always exceeded supply, despite the successive increases in available water brought about by reservoirs and inter-basin transfers. However, ‘new’ water has, each time, been committed outright. Figure 1 illustrate the water demand by sector, where agricultural activities use the largest percentage amongst the other sector. Figure 1: Water demand by sector in Zayandehrud Basin. 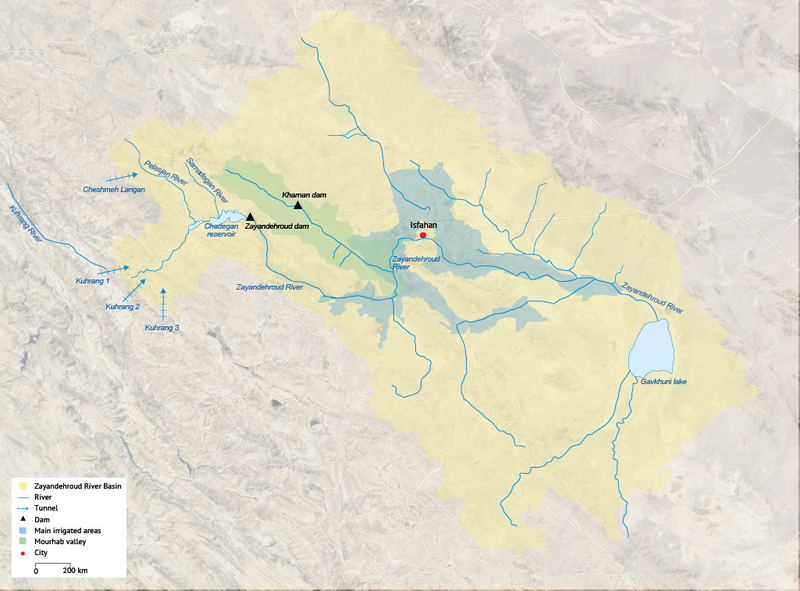 The basin’s resources were first augmented in 1953, when an inter-basin tunnel diverted water from the Kuhrang River to the Zayandehroud basin, adding 340MCM/yr to a natural runoff of about 900MCM. In 1970, the completion of the 1,500MCM-capacity Chadegan reservoir (see Figure 1) allowed the regulation of the water regime. Thanks to these two projects, water supply and storage in the basin dramatically increased. This date also almost coincides with the nationalization of water resources in 1968 (and the establishment of regional water authorities, subordinate to the Ministry of Energy), signalling the new power acquired by the state to control the lifeblood of the region and to design the expansion of the irrigation area in the valley, where an area of 76,000 hectares provided with modern hydraulic infrastructure was established. Yet, in many cases, these modern schemes were superimposed on the ancient network of maadi (canals) and qanats. Thus, the gains were limited, although double cropping became possible in most of the valley. With the opening of a second inter-basin tunnel from the Kuhrang River in 1986, another 250MCM was made available annually. The increased available supply, in addition to being committed to new irrigation areas, also met the growing needs of Isfahan (with its population now totalling 1.6 million, and a growth rate that reached 5% in some years) and of neighbouring industries. In 2010, an additional 260MCM was made available through the third Kuhrang tunnel, together with 200MCM diverted from the Dez River upper catchment (the Lenjan tunnel). Photo 2: Kuhrang Dam and Tunnel 1, Chaharmahal and Bakhtiari province, Iran (Source: MS96 , Wikipedia ). 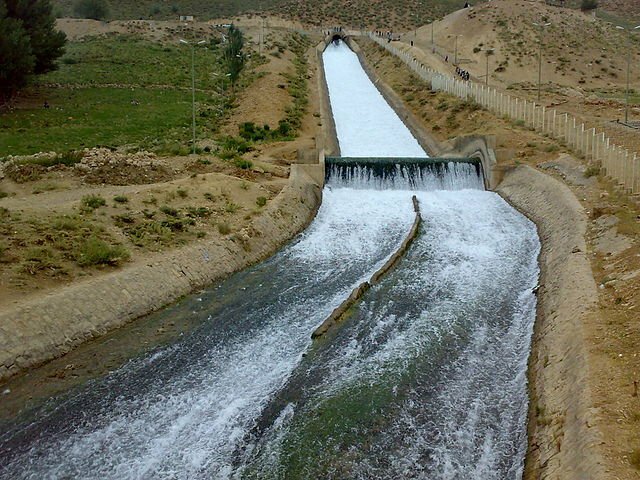 With all these development projects, one would expect the water needs of Isfahan to be fully met and agriculture to flourish in the watershed. However, water was committed to cities located in much drier areas (Yazd, Rasfanjan, Kashan) and outside the basin. Despite the periodic transfer of additional water from neighbouring basins, there is a constant over-commitment of water resources within the basin. ‘Donor basins’ complain about the diversions, claiming that they are not based on sound scientific analysis. The imbalance that results from interbasin water transfers is also attributed to political concerns. In 2014, the issue of insufficient flow, particularly in the summer, led to a series of protests. About 1,000 farmers in the east of Isfahan province drove their tractors 100km to the city and destroyed valves on pipelines carrying water to Yazd. There was further unrest in the spring of 2014, when farmers threatened additional protests if the river stayed dry. Although the central government in Tehran promised the farmers that the river would flow in the autumn, securing plant cultivation, those who benefitted from the previous government’s policies are reluctant to give up their gains. The damage in Isfahan province has been substantial. Analysts say tens of thousands of hectares of farmland have turned to desert. Many trees have died over the past years and land has subsided – a by-product of draining groundwater supplies, threatening the city’s historical sites, notably the bridges. The already severe water scarcity is being exacerbated by farmers’ careless use of the available irrigation water in the Zayandehroud basin. This is due to generous government subsidies that provide low agricultural water tariffs that has encouraged the wasteful use of a resource long taken for granted. Growing competition over water has led to overexploitation of groundwater resources across the province, which has more than 60,000 wells (of which 15,000 are illegal). By lowering the water table, well users (including those in the city who sank deep wells to irrigate large ‘green belts’ of trees planted ‘for the environment’) not only tap underground flows that used to contribute to the base flow of the river but also ‘drag’ water from the riverbed to lateral aquifers, to the detriment of irrigation downstream of Isfahan. As the Zayandehroud River has dried up, a 5,000-year-old civilization is on the verge of disappearing. The situation requires urgent action by every citizen in the basin as well as neighbouring basins. Although the government is introducing measures to balance water demand, the solution to restoring the basin lies in the cooperation and commitment of residents and farmers. Molle, F. et al. (2009). ‘Buying Respite: Esfahan and the Zayandehroud River Basin, Iran’. In River Basin Trajectories: Societies, Environments and Development. Comprehensive Assessment of Water Management in Agriculture Series 8. Molle, F. and Wester, P. (eds). Molle, F., Mamanpoush, A. (2012). Scale, governance and the management of river basins: A case study from Central Iran. Geoforum, 43(2), 285-294.